Submitted photo. Women’s soccer at head coach Dan Weiler at work with the team during a practice session. Weiler announced on March 5 that he would be stepping down as head coach to take a position with the Christopher Newport University women’s soccer team in Newport News, Va. Weiler began his new job on March 17. Women’s soccer head coach Dan Weiler stepped down on March 5 after 11 seasons with the program. Weiler has accepted a head coaching position at Christopher Newport University in Newport News, Va. 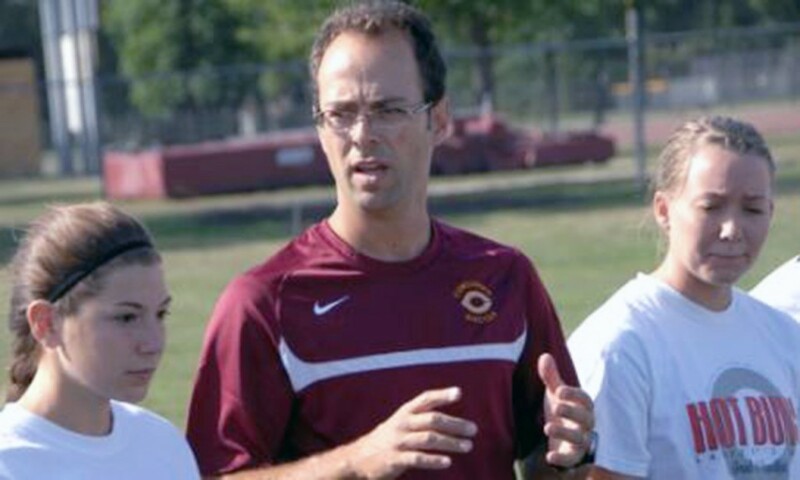 When Weiler came to Concordia College in 2002, he was the assistant coach for the women’s soccer team. After a couple of years, Weiler was offered a head-coaching job. He said he has seen the program transform throughout his time with the team. Before coming to Concordia, Weiler coached soccer at Fargo South High School from 1999 to 2006. He earned North Dakota Coach of the Year honors in 1999 and was a finalist for the National Girl’s High School Coach of the Year in 2002. Though Weiler’s impact on Concordia’s soccer program can be seen through the scoreboards, it shows even more through the women’s attitudes toward the sport and toward themselves. Midfielder Laura Prosinski’s game also improved with the help of Weiler. By encouraging a positive mindset, team togetherness, commitment, and encouraging selflessness, Weiler was able to create a successful soccer program. Prosinski said this was particularly important in her first year with the team. Like all coaches, Weiler made sure to have a good time with his team. He said his favorite way of doing this was by playing light-hearted pranks on the women with the help of their teammates. When Weiler first came to Concordia, he said he was surprised by how involved the school was with the athletic program. Weiler knew that leaving Concordia would be difficult. However, he said he felt it was time for a new adventure. As Weiler starts his new head-coaching job at Christopher Newport University, Concordia will be on the lookout for another head coach. This process is very important for the program to continue its success, and Weiler hopes the women will be a part of the search. He offered advice to the athletes as they set out looking for a new coach. Even though the team doesn’t want Weiler to leave Concordia, they wish him nothing but success. “I understand why he has to leave, and I support him just like he would support me if I were the one leaving,” Hayes said. As Weiler starts his new position at Christopher Newport University on March 17 and the women’s soccer team starts their search for a new head coach, both will be headed into unchartered territories. Weiler hopes the women stay true to themselves and the program this coming season. “Make sure to protect what you all feel is important,” Weiler said. I wonder where you are? How many Concordias are there? I’d like to see you add the city and state to every page. Thanks for the input. We are located in Moorhead, Minnesota. As far as I know there are only a few Concordia Colleges (here and New York). Next time feel free to give us an e-mail at Concord@cord.edu.